The Center for Solar System Studies (CS3) is a organization dedicated to the study of solar system objects. Its focus on the study of asteroids from Near Earth Objects to Jupiter Trojans and everything in between. 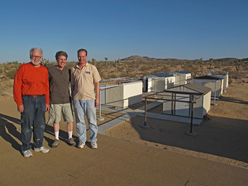 In addition, participants at CS3 study variable stars and galactic streams. 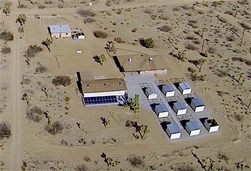 In 2011, CS3 acquired its observatory site in Landers, California. This five acre parcel has three buildings, a main house, a guest house, and a 1,000 sqft free standing garage and workroom. 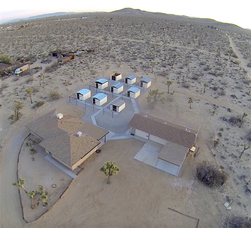 Nine observatories have been constructed housing 15 telescopes. The observatory complex at dusk.